Developer: Divide By Zero, Ltd. 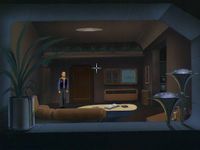 The Orion Conspiracy is the title of a graphic adventure computer game that was released in 1995. The game was published by Domark and developed by Divide By Zero. The Entertainment Software Ratings Board gave the game a "Teen" rating, while the ELSPA gave it a "18+" rating for its profanity, violence and reference to homosexuality. The game was released on DOS and later the Windows operating system. In the year 2160, the universe is run by corrupt corporations and governments that will do anything in order to get what they want. On a space station, Devlin McCormack has just buried his son, only to receive news that he was murdered. Now, Mr. McCormack must face murderous leaders, and space aliens in order to bring his son's killer to justice. Along the way you interact with various people, solve puzzles and learn that your son was in fact having a romantic relationship with another man. Source: Wikipedia, "The Orion Conspiracy," available under the CC-BY-SA License.